Dr. Bruce Jackson, director of Columbia College-Moberly, watches as Dr. Gerald Brouder, president of Columbia College, and Dr. Evelyn Jorgenson, president of Moberly Area Community College (MACC), sign a reverse transfer articulation agreement on March 9 at Columbia College in Columbia, Mo. 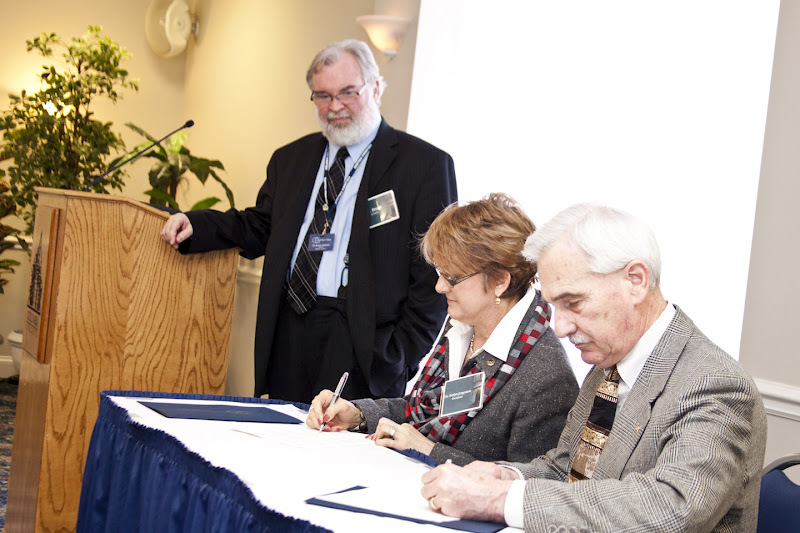 Columbia College-Moberly signed a new reverse transfer articulation agreement with Moberly Area Community College (MACC) on March 9 at an appreciation luncheon held on the Columbia College campus in Columbia, Mo. At the luncheon, the two colleges celebrated the agreement, which allows students to submit Columbia College credits toward an associate degree from MACC. “This exciting new development offers MACC students the opportunity to have an associate degree in hand while they pursue their baccalaureate studies at Columbia College,” said Dr. Bruce Jackson, director of Columbia College-Moberly. Columbia College-Moberly was established on the MACC campus in 1996, and the two institutions have enjoyed a close educational partnership ever since. Through their 2-Plus-2 program, students finishing an associate degree with MACC transfer directly to Columbia College for their last two years of a bachelor’s degree. Columbia College-Moberly is one of four Columbia College Nationwide Campuses that is housed on a community college campus. Columbia College-Moberly offers three bachelor’s degree programs in-seat as well as 23 associate, bachelor’s and master’s degrees online.